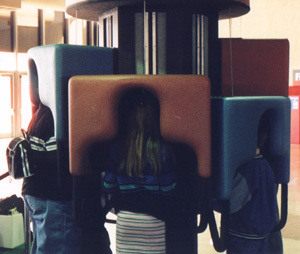 A mobile, multiple unit "station" for viewing stereoscopic 3-D media, (i.e., video), by several viewers simultaneously, without the necessity of wearing any viewing equipment on the viewer's head. This is achieved by having an arrangement of viewing "pods" positioned around a central axis. Each "pod" is designed in an ergonomic and acoustic manner, so as to accommodate most any body size and/or height, (child to adult). 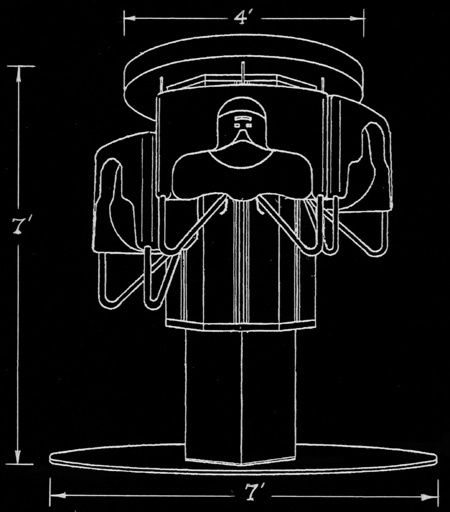 Furthermore, a stereoscopic LCD viewing device with appropriate optics, is installed in each "pod". In addition each "pod" has an audio system with low wattage transducers located in the vicinity of each ear, so as to produce audio associated with the visual stereoscopic content. Lastly, each "pod" is constructed so as to be easily and quickly adjusted to each viewers comfortable height. This adjustment of height is accomplished by means of a "braking mechanism" which is designed in such a way as to move freely in an upward, (raising), direction with an automatic locking, (braking), feature. However, to move in a downward, (lowering), direction, the viewer would disengage the automatic locking, (braking) feature with the "hand operated release lever".